Is 2019 the year of the vegan? Carl’s Jr and others are betting on it. Across social media, trend hunters and animal enthusiasts alike are proclaiming 2019 the year of the vegan. From Kind and Tyson, to Forbes and The Economist, to Taco Bell, McDonald’s, KFC and Carl’s Jr, experts are predicting – and perhaps willing – 2019 to be the undisputed Year of the Vegan. Across social media, trend hunters and animal enthusiasts alike are proclaiming 2019 the year of the vegan. From Kind and Tyson, to Forbes and The Economist, to Taco Bell, McDonald’s, KFC and Carl’s Jr, experts are predicting – and perhaps willing – 2019 to be the undisputed Year of the Vegan. According to The Economist’s report, “Where millennials lead, businesses and governments will follow.” And it is the millennials who are distinctively leading the charge toward plant-based living, followed closely by their rapidly-coming-of-age counterparts, Gen Z. Fast and slow food brands alike are jumping on the bandwagon. McDonald’s has started selling vegan hamburgers. Taco Bell announced an all new, all-vegetarian menu. Waitrose in the UK launched a new line of vegan products. And according to The Economist, sales of vegan foods in America in the year to June 2018 rose ten times faster than food sales as a whole. Celebrities and film producers continue to push the trend, not least of all professional athletes like NFL quarterbacks Aaron Rogers and Tom Brady, whose mostly plant-based diets have now become legendary, dispelling the myth that meat is necessary for protein and strength. Other US celebrities from Beyonce and Miley Cyrus to Arnold Schwarzenegger and Al Gore have spoken out in favor of plant-based diets. The slow and steady reign of veganism makes sense, as consumers collectively begin to grow more conscious of the dire effects of climate change and global farming on the planet. Last year, a group of scientists and researchers from the University of Oxford and LCA Research group released the most comprehensive study on food production’s environmental impact. They noted that the single biggest thing we can do to reduce this impact is to consume less meat and dairy. 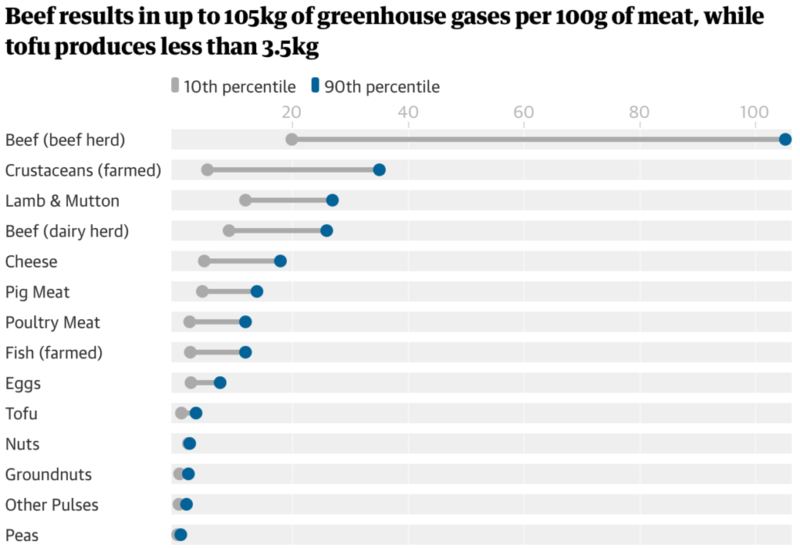 The study showed that while meat and dairy provide just 18% of calories and 37% of protein, they occupy 83% of farmland and produce 60% of agriculture’s greenhouse gas emissions. “A vegan diet is probably the single biggest way to reduce your impact on planet Earth, not just greenhouse gases, but global acidification, eutrophication, land use and water use,” said Joseph Poore, at the University of Oxford, who led the research. Other factors, like a general progression toward health consciousness and a healthier lifestyle, along with more affordable vegan options, have further prompted the movement. Finally, firms are getting better at replicating the real look, feel and taste of meat with lab-grown varieties. Impossible Foods, the SF-based fake meat lab who has raised $400M in funding and whose wildly popular Impossible Burgers took the US market by storm, have announced development of a new meatless steak. Meanwhile, Dutch firm Vivera arrived on supermarket shelves in June, and 40,000 of its vegan steaks were sold within a week. The “Year of the Vegan” began rising on social media and blogs around December, when trend predictions for 2019 started to pick up. Among major US fast food chains, mentions of veganism and plant-based meals over the last 100 days has risen significantly, with Carl’s Jr. standing out above the rest. 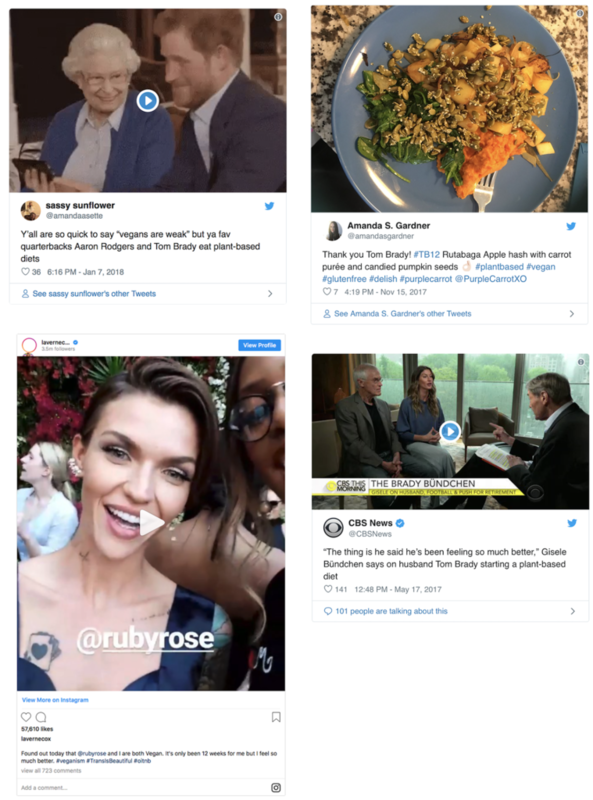 27.3% of all Carl’s Jr. posts on social media in the last 100 days spoke to vegan and veganism trends. This is in larger part due to the announcement of their new Beyond Meat Burger, a vegan addition to the menu that is being pushed hard in early 2019. 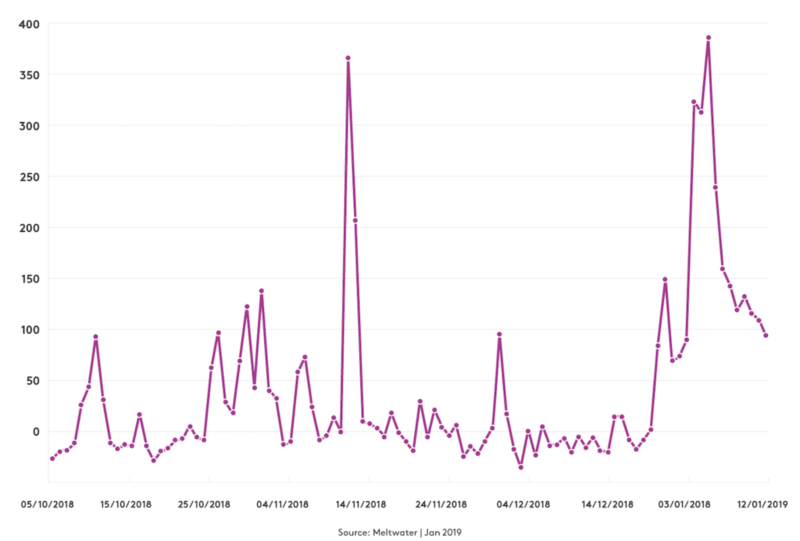 Vegan eaters have caught on, as mentions of Carl’s Jr. overall began spiking significantly since the new option was announced. Incidence of conversation around “the year of the vegan” hit a major upswing as we ushered in 2019, while trend hunters from across industries contributed their 2019 forecast. Fast food chains from Subway to KFC are hopping on the bandwagon, led by Carl’s Jr. who announced in late December the release of their latest creation, the Beyond meat burger. We’ve dug into insights from social media which indicate reactions have been positive. This post was originally published on Outside Insight. An online resource designed to help business executives understand the power of external data and the impact of forward-looking insights on the decision-making process.